Hot from the oven, happy to announce my first tutorial for year 2009. Just in time for Valentine! 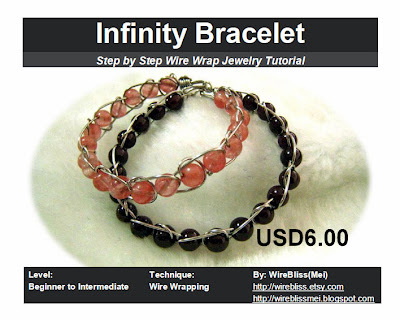 This lesson teaches you how to create a wire wrap Infinity Bracelet with just one piece of wire including the hook and eye. If you love making a piece of wire jewelry out of one piece of wire, does not take up hours of your time (half an hour to 1 hour), then you will definitely love this tutorial. Only one piece of 92 cm (36 in) 22ga soft wire and 22 round beads/stones (6mm to 7mm) with the usual tools - pliers mostly. Head on to my etsy shop to purchase or you may click on the paypal button above which will bring you to paypal payment processing page.